This series of garments was created for The Maryland Military Museum’s 2017 exhibit on Johns Hopkins Base 18 and WWI era nurse Bessie Baker. After looking at several original images of Bessie Baker both prior to and during the War, I decided upon this design for her uniform. The design of her uniform is actually a blend of her prewar nursing uniform, her war era uniform, an illustration found in a WWI era recruitment poster, and an extant JHH gown in the collection of Johns Hopkins School of Medicine Archives. Her cape is drawn directly from this one in the Johns Hopkins School of Medicine Archives. In addition, I also created a nurse’s cap, armband, and located a pair of black shoes in the style of the pair shown in this period illustration. This was by far my most heavily researched commission for 2016 but also one of the most fascinating. This entry was posted in Commissions, Exhibits, WWI Uniforms and tagged Bessie Baker, John Hopkins Hospital, WWI on January 21, 2017 by Susan. We made these mid 19th century girl’s garments for The Andrew Johnson Homeplace for their education and interpretation programming. Sizing is for girls ages 12-14. For more information about our historical children’s garments or any of our custom made clothing, please visit our website at www.maggiemayfashions.com. This entry was posted in 1840s, 1850s, 1860s, Children's Fashions, Commissions, Exhibits and tagged Andrew Johnson Homeplace, National Park Service on January 21, 2016 by Susan. This past summer while on an Association for Living History and Farm Museum conference in Akron, Ohio, I (along with other historical clothing professionals) was given the opportunity to get a behind the scenes tour of the Kent State University Museum’s fashion collection. While there, a presentation on collections management was given by Joanne Fenn- the registrar. We had the opportunity to chat with Jean Druesedow, and were given tips about mounting and display of historical textiles by Jim Williams- the museums exhibitions expert. Sara Hume was on hand to answer any curatorial questions, and Kevin Wolfgang let us have a hands on experience in recreating historical textiles. This entry was posted in Exhibits, Extant garments, Symposiums and tagged ALHFAM, Kent State Museum on October 26, 2013 by Susan. A few years ago, I teamed up with Boston Productions to create a series of 1860s era gowns for their film project in conjunction with the 1863 Raid on Indiana exhibit for Conner Prairie. 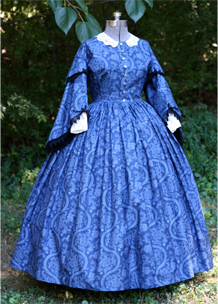 Flash forward to 2013 and now teaming up with AMP Agency, here is a gown created for the Kenosha, WI Civil War Museum. The fabric selections were made by the film production team and the design is by us. 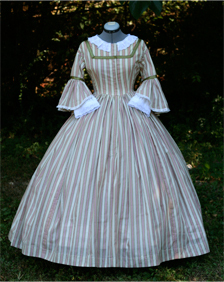 Gown is shown and will be worn over an elliptical cage crinoline and overpetticoat, chemise, and corset. This entry was posted in 1860s, Commissions, Exhibits and tagged Civil War Museum Kenosha, Wisconsin on June 22, 2013 by Susan. Last weekend (June 3-4) marked the opening of Conner Prairie’s new interactive exhibit entitled 1863 Civil War Journey: Raid on Indiana. As terms of my contract, I was asked to hold off all discussion of this project until it was unveiled. Now that the exhibit opening is past, I am free to discuss my participation. In addition to advising on appropriate historical attire for this project, I created a total of 13 garments for this exhibit. Two of the dresses I designed are worn by the key actresses in the Journey’s film. The third dress I created was a young girl’s dress for an animated figure playing a violin. I provided the corsets, chemises, cage crinolines, and petticoats for the both the actresses and the permanent displays as well. This entry was posted in 1860s, Commissions, Exhibits on June 9, 2011 by Susan. Colonial Williamsburg’s virtual museum: Browse their collections online! Kent State University’s upcoming exhibit commemorating the American Civil War. Click here for the link to the upcoming exhibit. Also, Kent State University is creating a searchable catalogue of their collection! Exciting! This entry was posted in Exhibits on February 3, 2011 by Susan. The Charleston Museum in Charleston, South Carolina currently has on exhibition clothing and textiles from the Civil War Era. From their website, it looks like they may have a few of the gowns from The Young Victoria. This entry was posted in Exhibits on January 27, 2011 by Susan.